China's Environmental Policy Research Papers help outline the current environmental policy of China in relation to political science and economic issues. A series of economic reforms starting in the post-Chinese Civil War era has allowed China to realize an astonishing economic and industrial growth over the last few decades. As the nation's industrial economy has expanded, manufacturers have created an ever-greater impact on the environment, in terms of both the use of power and natural resources as well as the pollution that is the result of industrial production. Half of China's population – nearly 700 million people – consumes contaminated water and it is estimated that in the next twenty years, the country will produce 37 percent of the Earth's pollution (Song & Woo, 2010, p. 5; Wu, Maurer, Wang, Xue, & Davis, 1999, p. 251). Despite some early efforts at negating the damaging ecological effects of industry, the Chinese government's inconsistent environmental policy has not been strong enough to keep pace with the problem. As the effects of environmental pollution became more well-known in the 1980s and 1990s, China, as one of the world's foremost offenders, became leaders of the movement to reduce Greenhouse emissions and counteract environmental destruction. China was the first country to ratify the United Nation's Framework Convention on Climate Change Treaty (UNFCCC) in 1992 (Jeon & Yoon, 2006, p. 847). Likewise, China made some early strides in combating pollution internally. The government organized clean-up efforts for polluted waterways and created watchdog organizations such as the National Environmental Protection Agency (NEPA) to safeguard the environment. Still, polluters found ways to circumvent regulation, such as opening their factories at night to avoid governmental intrusion (Economy, 2006, pp 2-7). China also found itself with divided factions within its government. There existed a conflict between the environmentalists and those who felt that reducing pollution came at too high a cost to the country's economy. The Chinese delegation to the Kyoto Conference in 1997 rejected the treaty, asserting state sovereignty over international cooperation and questioning the science behind climate change. Instead, China joined the Asia-Pacific Partnership (APP), an organization that supports, but does not make mandatory, the reduction of greenhouse emissions (Jeon & Yoon, 2006, pp. 858-66). In the last part of the Twentieth century, China's fantastic economic growth has propelled forward new industrial development. All the while, China overwhelmingly relies on environmentally damaging materials to realize this growth, from steel mills to using coal to power its industry (Jeon and Yoon, 2006, p6). Despite being an early adopter of international environmental cooperation, China has vacillated in its commitment to environmental regulation, allowing pollution to run rampant and wreaking havoc on the country's fragile ecosystem. Economy, E. (2010). The River Runs Black: The Environmental Challenge to China's Future. New York, NY: Cornell University Press. Jeon, H., & Yoon, S. (2006). From International Linkages to Internal Divisions in China: The Political Response to Climate Change Negotiations. Asian Survey, 46, 846-866. Wu, C., Maurer, C., Wang, Y., Xue, S., & Davis, D. (1999). Water Pollution and Human Health in China. Environmental Health Perspectives, 107, 251-256. Culture of China research papers examine Chinese culture up to the time of China's Cultural Revolution. 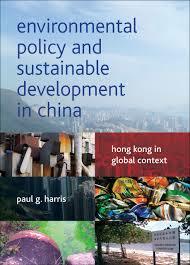 Country Analysis of China research papers overview the economic aspects of the Chinese Economy. Research papers on acid rain discuss the effects it has on the ecosystem. Sustainability and Culture Research Papers - This is a topic suggestion on Sustainability and Culture from Paper Masters. Sustainable Development - Order a research paper on sustainable development from Paper Masters. Abandoning Fossil Fuels Research Papers - many environmental research papers will want to look at the prospect of abandoning fossil fuels. Sustainable Development and Government - The main components of sustainable development are economic, social, and environmental. Paper Masters writes custom research papers on China's Environmental Policy and help outline the current environmental policy of China in relation to political science and economic issues.